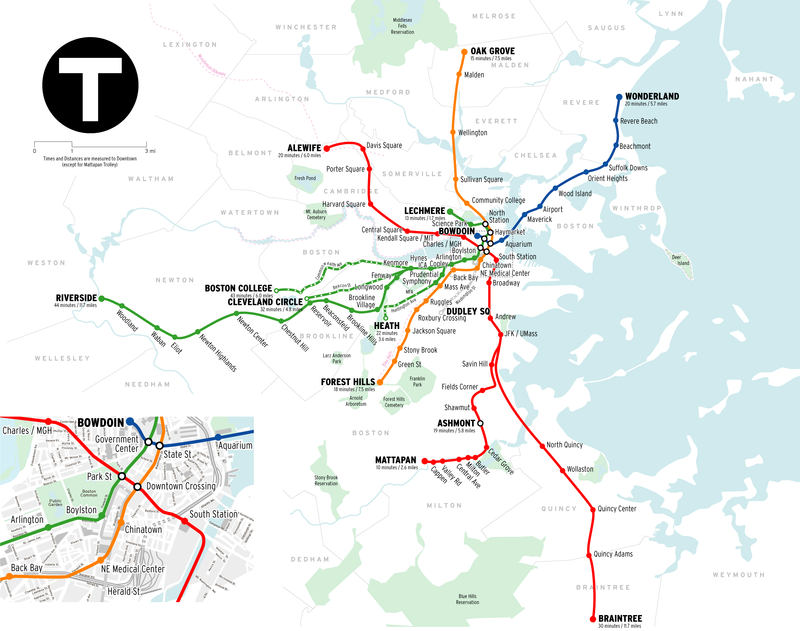 Having lived in various parts of the Boston Metro area for 24 years, I have experienced the local public transportation system from many angles: at different times I have been a regular user of the bus, the “T” (Boston’s nickname for its subway), and the commuter rail – all managed by the Massachusetts Bay Transportation Authority (MBTA). I have also experienced public transportation in many cities around the world: I carry active public transportation cards for Boston, New York, Washington, Chicago, London and Rome. Given the choice, I would much rather take public transportation than a taxi or car. Sadly, I have found that in some ways, Boston’s public transportation system is uniquely and frustratingly inadequate. To elucidate my frustration with Boston’s public transportation system, let me share an anecdote. I live in a central location of downtown Boston. Within a five-minute walk I can reach multiple T stops on all four Green Lines (B, C, D, E) and on the Orange line; there is a bus stop on a major line less than 100 yards from my front door. From my condo, under favorable traffic conditions, I can get to Boston’s Logan airport in about eight minutes and as much as fifteen minutes on a bad day. Last night I arrived at Logan just after 8pm (a pretty busy time when many business people return from trips) and did not have my car. I decided to be good and take the T instead of a cab. At exactly 8:20 p.m. I was standing at the curbside shuttle stop for the T. It took about fifteen minutes before the shuttle arrived, then another fifteen minutes before an inbound Blue Line train arrived at the Airport station. I finally got home at 9:12. In all, it took me fifty-two minutes to travel roughly five miles! I have made the same trip on a few occasions, trying both the Blue and Silver lines, and have never made it in less than forty-five minutes. By comparison, if you live in Washington, Chicago, London or Rome, taking public transportation to the airport can save you substantial amounts of both time and money. Not all cities have this level of connectivity, but I cannot think of any other city where the airport is so close to downtown, and so hard to reach by public transportation. There are several factors that I believe contribute to the problems with Boston-area public transportation. First, for rail transportation (subway and commuter rail), the lines are laid out in a hub-and-spoke configuration that makes travel easy if you want to move along one of the spokes, but frustratingly difficult if you are trying to connect between any two points not along a spoke. Second, I don’t believe the MBTA really understands its customers, a shortcoming that leads to a dismal experience and discourages people from using public transportation. By this, I am not referring to typical customer service complaints, such as the aging fleet with frequent breakdowns, the difficulty of getting information about a trip, or the occasional uncaring or downright rude behavior of MBTA personnel. I am referring instead to the ostensible lack of understanding of whyconsumers use public transportation, where and when they need to use it, and how they want to use it. People want to get to and from work. They want to get to places where they can conduct business or be entertained. And they want to be able to do it in a reasonable amount of time. Why is it so incredibly hard to get from North Station to South Station (the two main rail hubs in Boston)? Why is it so hard to get to the airport? Why aren’t there more preferential bus lanes to help buses avoid congestion? Why don’t buses have more regular and consistent schedules? Why is it so hard to get information about the status of individual buses and trains for adequate planning? Why does the T stop running an hour before bars and clubs close at night? 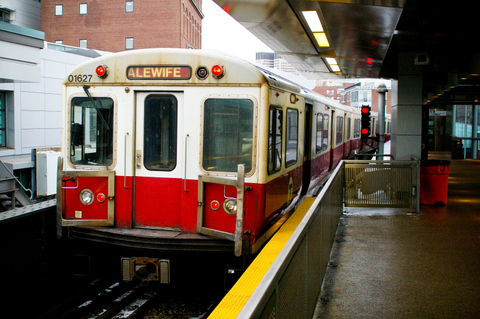 The MBTA is saddled with debt, and is understandably reluctant to make substantial infrastructure investments to change the layout of its subway and commuter rail. But there is no excuse for the customer-related problems. Raising fares and reducing service, as was recently proposed, will only make matters worse. You can’t expect people to use a service if that service does not give its customers what they want. And if you don’t understand what your customers want in the first place, you’ll never be able to improve matters. This is a classic example of a highly complex system with millions of moving parts and rich interconnections at many levels: geographical, temporal, social and economic. As such, it is not a problem that can be solved by conducting surveys or by congregating a bunch of smart people and consultants to brainstorm ideas; and using a traditional, statistical approach to analyze data is virtually useless because it says little about how the system’s response will change if substantial changes are made. This is exactly the type of problem that can benefit from a bottom-up, customer-centric simulation that captures the rich interactions within the “public transportation ecosystem” to understand how individual behaviors lead to the observed emergent, system-level outcomes such as ridership levels, overall adoption, and usage patterns. This type of bottom-up simulation would allow the MBTA to test many different hypotheses and plans, and figure out what it’s about to get into before actually getting into it. Until the MBTA takes this type of holistic, quantitative, data-supported approach, it is unlikely that things will improve. Mr. Davey, please feel free to drop me a line – I would love to help you figure this out so that in a few years I can take the T to work as you do and never have to take a cab to the airport again. “Agent-Based Modeling: Methods and Techniques for Simulating Human Systems”.